It is possible that Apple might update the CUPS file modified by AirPrint Activator. If such a thing was to happen AirPrint would stop working… but AirPrint Activator would still report that AirPrint is ON based on how version 1.1 detect the ON/OFF state. This new version of AirPrint Activator is now using a new method to add/remove the necessary changes to the system file and to detect when AirPrint is ON or OFF. It no longer need to rely on a backup file to disable AirPrint. Instead, it will simply remove the added line from the modified file while leaving everything else in place. This should prove usefull in the event of Apple replacing the modified file while a backup is in place. Disabling AirPrint after Apple updated the system file might result in the loss of the Apple CUPS Updates made to the file… which might not be desirable. I suggest that you download this new version just in case you need to enable AirPrint again. You can grab v1.1.1 from the main application page. I’ve been searching the web for some time now, looking for the official AirPrint specification, but I just can’t find it. I assume AirPrint Activator is based on Apple’s spec. Where did you find it? (I’m actually working for a printer manufacturer and we’re interested in investigating the possibilities of implementing AirPrint). 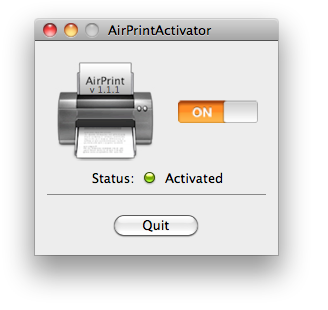 Unfortunately AirPrint Activator only apply a tweak to the OS to activate a hidden feature. It does not implement AirPrint on it’s own but rather rely on Apple’s implementation in the OS.